But the class loved it and you will too, especially at a 50% discount if you purchase it today. You can use coupon code DEAL at checkout today and receive a 50% off the DVD, digital download or both. But this isn’t just for Black Friday – we are planning to feature a special PRO/Deal of the Week every Friday! Much like Groupon for Indoor Cycling Instructor’s, our PRO/Deal of the Week will feature a different product or service, at a substantial discount, every Friday! The Twin Cities area of Minneapolis and Saint Paul, Minnesota, and the neighboring Wisconsin countryside is nationally known for its cycling-friendliness. 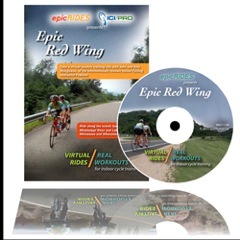 Now, you can take a virtual tandem training ride in this beautiful area with John and Amy Macgowan and friends, of the internationally renowned Indoor Cycle Instructor Podcast and Indoor Cycle Instructor Pro Website. Includes our new “Just the Ride” menu option which gives indoor trainers, coaches and instructors a choice of 60 minute and 45 minute versions of the ride to fit their training or class requirements. Details: Can not be combined with other coupons, discounts or offers. Hurry, there’s only 50 copies available at this price. You can order here – be sure to use code DEAL.